The massive outdoor science carnival provides a packed day of non-stop family-friendly activities, hands-on experiments, live performances, educator opportunities and explosive visuals. The Philadelphia Science Festival will be back for the eighth year this spring. There will be more than 80 events over nine days across the city, beginning Friday, April 20. The annual, epic science carnival will close out the event. For the past two years, the free event has taken place at the Great Plaza at Penn's Landing, but will return to the Benjamin Franklin Parkway for 2018. Last year, the carnival attracted more than 50,000 curious science-lovers looking to try hands-on experiments, watch live performances and marvel at explosions. Close to 180 exhibitors participate, so there's always something going on at the daylong extravaganza. While the carnival is the biggest event during the Philadelphia Science Festival, the other events are worth checking out, too. Below is a list of what's new for 2018. As for returning favorites, Murder at the Mutter, Fishtown Science Crawl, Be a Scientist Day and Citywide Star Party are always popular. Tickets for festival events are currently available. While many are free, reservations are still required. 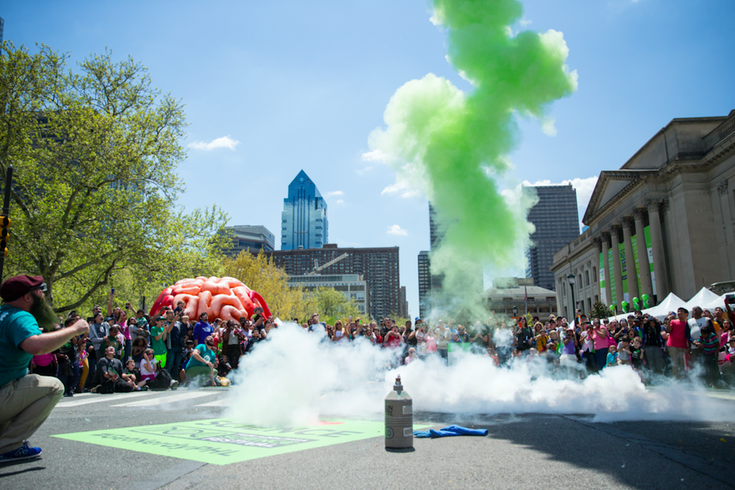 "The Philadelphia Science Festival is one of the most innovative and engaging ways for Philadelphians of all ages to interact with the region’s rich science community," said Larry Dubinski, president and CEO of the Franklin Institute, which is the lead organizer of the festival.